I crocheted a baby afghan in 2003. Now that I am great grandmother I decided to crochet baby booties; forgot how to crochet and gave up on booties. Maybe if I did the same blanket as in 2003? 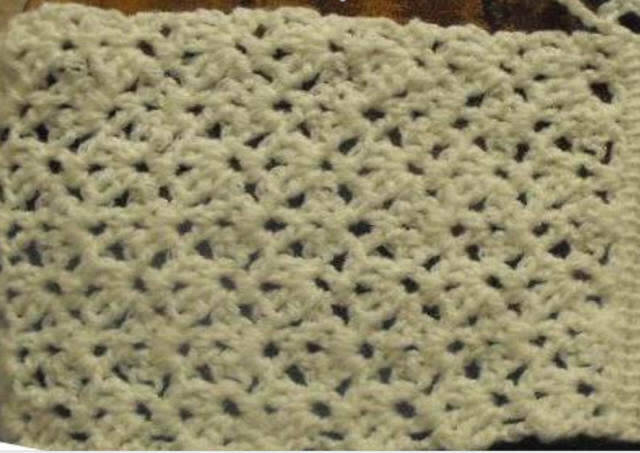 With much help from Googling crocheting forums I am now up to edging around my lace squares. I finally have ten loops going across Afghan Stitch Square (directions in Bold). I don’t know where to insert my hook (highlighted in Italics—what amounts to 1 ½ rows?) across Lace Square. EDGING AROUND PANELS: With loop on hook, st st in first row of afghan st at lower corner of panel, working along long edge ch 4, skip 2 rows sc in next row, * ch 4, skip one row sc in next row; rep from * across Afghan Stitch Square, having ten loops across. *ch 4, skip 1 ½ rows sc in next row; rep from * across Lace Square, having ten loops across. Work edge around 4 sides of panel.